I’m fairly convinced I could eat anything wrapped up in a tortilla. Tacos have become my new pasta: whenever I’m not sure what to make for dinner, I clean out the fridge and wrap the ingredients in a tortilla, preferably with some type of sauce on top. 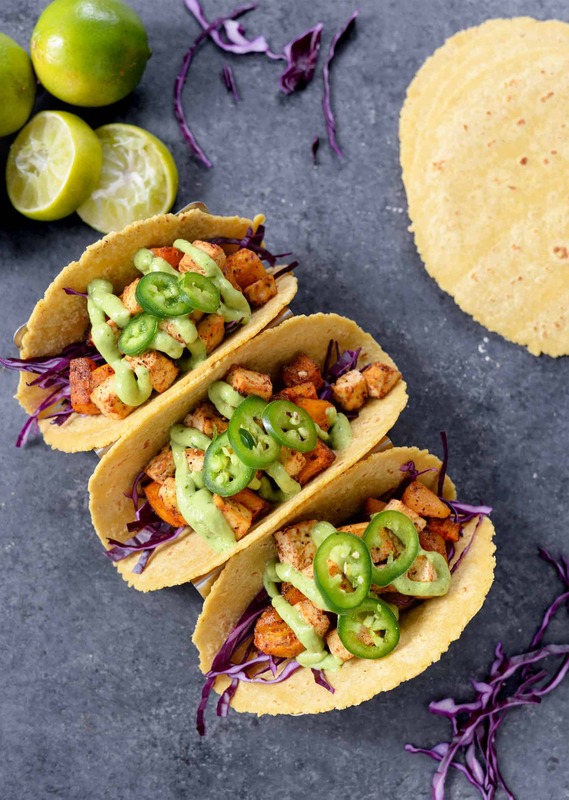 While I still do something similar with pasta (almost everything tastes good with a noodle), there’s something a bit more fun about tacos. These were a creation of a night when I wasn’t sure what I was going to make for dinner, but I knew I wanted something that felt both hearty and light at the same time. That ever elusive feeling of loading your plate up with nourishing foods, but not feeling so full that you can’t get stuff done in the evening. The evening time has become this magical hour. We’re now trying to put Van down before 7PM, leaving a few hours for BL and I to either enjoy a late dinner together, catch up on work, or get to whatever chores we didn’t get to during the day. To stay energized, I know that my dinner meal can’t be too heavy (or include wine) or else I’m guaranteed to want to lay on the couch in favor of anything else. This is fine some of the time, but not all of the time, you know? I know the combination of butternut squash, tofu, red cabbage and the yummiest avocado sauce sounds weird but TRUST it. It’s maybe one of the tastiest tacos I’ve ever put together and something that I crave now on an almost weekly basis. Roasting tofu in the pan with squash gets it nice and chewy, with a yummy crust on the outside. I swear I eat half the pan while I’m putting these tacos together. For crunch and texture, I like a simple bed of finely shredded red cabbage. Lettuce or green cabbage could work, but you really want all the crunch to balance the soft roasted squash and tofu. To pull it all together, drizzle on an avocado-lime sauce. It’s like guacamole, but fancier. I judge all of my sauces by one criteria: do I want to lick the entire bowl/spoon/food processor blade once I’m done? If so, it’s good to go. Obviously, I stuck my tongue in all of the nooks and crannies to get out every last drop of sauce. 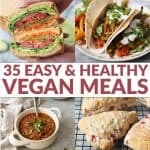 For those of you who are really into meal-prep/batch cooking like I am these days- you are in luck! Here’s how I do it: I make a double batch of the squash/tofu mixture and place in the fridge until ready to use. The sauce will keep for 1-2 days in the fridge and the shredded cabbage will last 2-3 days in the crisper once shredded. Then, assemble as needed! I also love any leftover squash/tofu in a grain bowl with the extra sauce (try it with couscous or quinoa) or on a giant taco-like salad with tortilla chips, more avocado, a can of beans and whatever vegetables I have lying around. 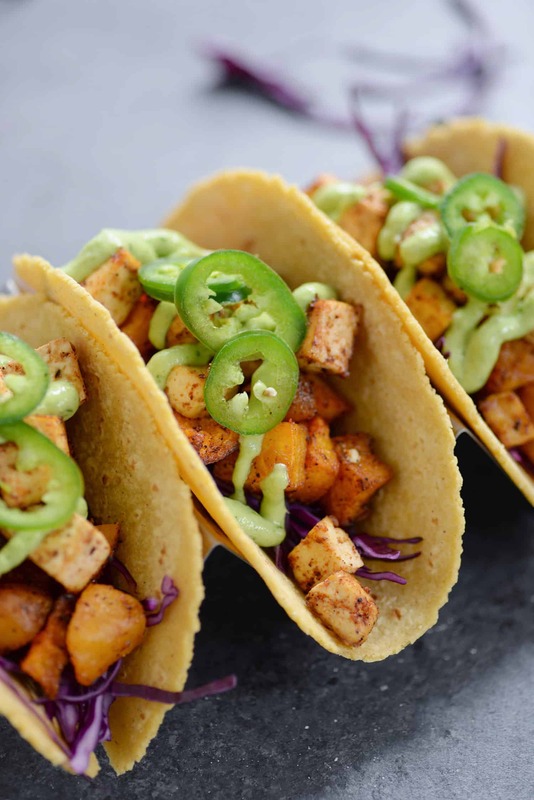 Roasted Butternut Squash and Chipotle Tofu Tacos with Avocado Cream Sauce. 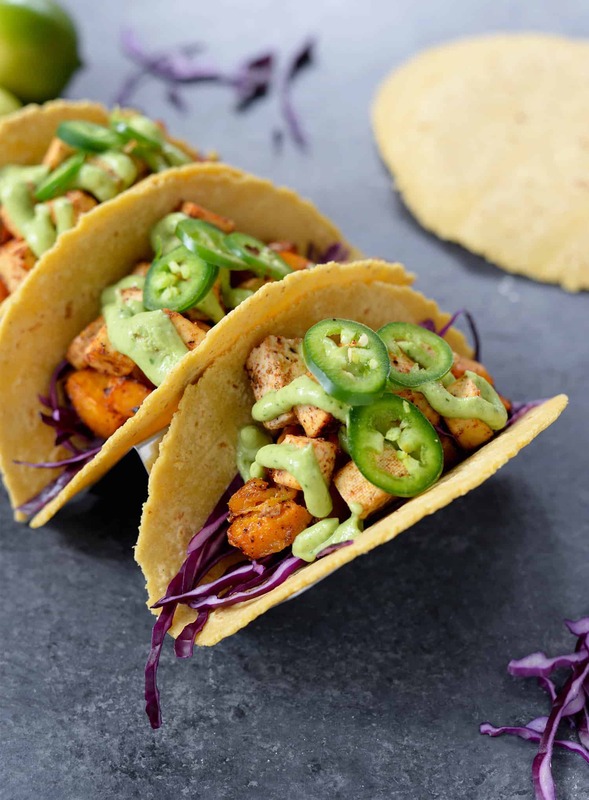 These vegan and gluten-free tacos are amazing! A must make. Combine together the chipotle powder, garlic powder, salt, pepper and chili powder. Divide half of the spice mixture on the squash until coated. 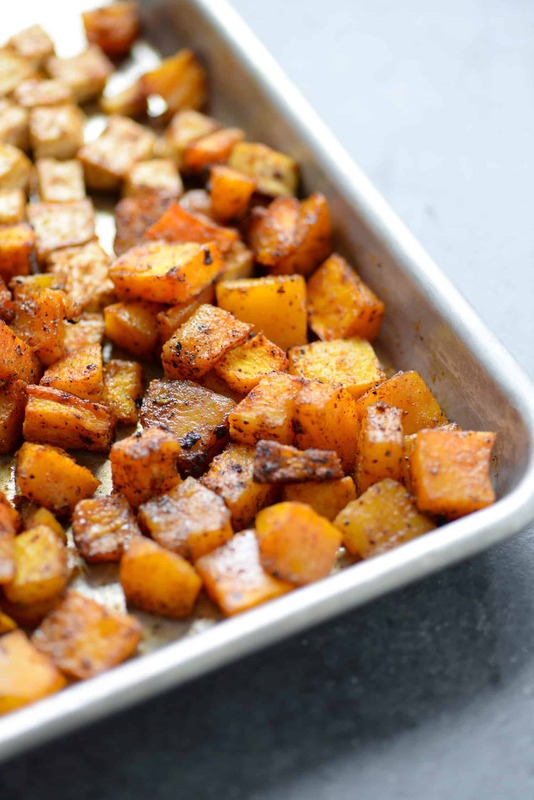 Place in a single layer on a baking sheet or roasting pan and cook for 35-45 minutes until tender and slightly caramelized. Depending on the size of your pan, you may need two. Take care that the squash is in a single layer, otherwise it will steam and won’t get crispy. Rub the remaining spice mixture with 1 teaspoon oil on the tofu. Place in a separate baking sheet in a single layer and bake for 25 minutes until chewy and golden brown. While the tofu and squash are cooking, puree together the avocados, salt, cilantro, lime juice and soy milk until creamy. Depending on how ripe your avocados are, you may need to add more soy milk and/or lime juice. Set aside. 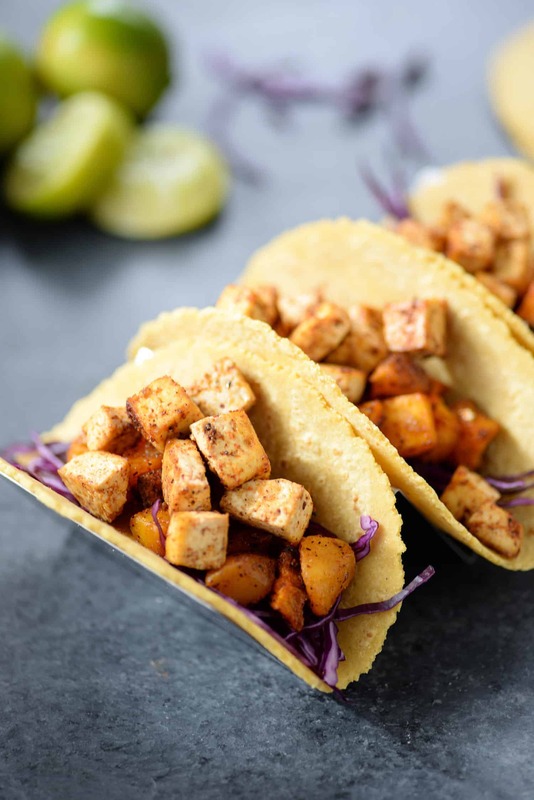 To assemble, divide cabbage among corn tortillas and top with tofu and squash. 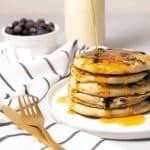 Drizzle with avocado cream and serve.